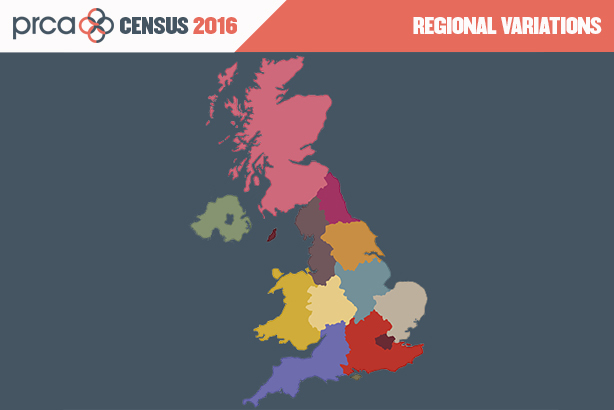 Part three of the PRCA's 2016 Census looks at regional variations, with the South East showing the highest pay levels and the most diversity. The PRCA’s 2016 Census of the PR and comms industry paints, in some cases, a disturbing picture of a sector that, although largely young and vibrant, continues to lack diversity in terms of background and gender. As for remuneration, average salaries have been slashed across the board for both agency and in-house teams, and cuts to senior pay appear to have been most severe since the last census in 2013. The survey of 1,874 practitioners, carried out by YouGov, also reveals stark differences in levels of pay, gender balance and average age across the regions of the UK, and asks respondents to predict what will be the most important tasks in their jobs in two years’ time. Danny Rogers, PRWeek’s editor-in-chief, says: "As someone who has been in and around this industry for two decades – first as a graduate trainee in PR, and later as an industry editor and author – what strikes me about the PR Census is how little the big themes actually change. We are still discussing the future of print, the hot growth of healthcare and tech, the difficulties of measurement and the lack of diversity. But the industry is getting most things right. Because for most of those two decades UK PR spend has been growing rapidly, and continues to do so. Another constant is PR’s adaptability – and this is more critical than ever as technology and media rapidly transform each other." Francis Ingham, PRCA director-general, tells PRWeek: "Considering the salary figures, there’s a welcome shift from a top-heavy model to one that more appropriately rewards the people who do the most work. I believe this is a result of two things: on the one hand, consolidation of major networked agencies; and, on the other, CEOs and board members having the confidence to set up their own outfits, while taking a sizeable pay cut. The entrepreneurial spirit is back." In the third of our five-part series on the census, PRWeek looks at regional variations across the industry in pay, background and average age. London boasted the highest average pay, at nearly £49,000, and the lowest proportion of people from a white British background, at 78 per cent, and the average age was 28. In the South East, average pay was £45,000 and the average age of employees was 38, while 88 per cent described themselves as white British. Wales had the most even gender split among employees, with half the respondents female, but reported the lowest average pay, at £36,000. In Scotland, average pay was £38,000 and the workforce was 89 per cent white British. In Northern Ireland, employees were paid an average of £35,000 and the mean age was 33. In the South West, 75 per cent of employees were female and the average age was 38, while average pay was nearly £39,000. The East of England had the highest number of people who carried out pro bono work and women made up 66 per cent of the workforce, while average pay in the region was nearly £44,000. In the Midlands, average pay was nearly £39,000. In the North West the figure was £40,000. The region also had the highest proportion of people with a masters degree. Finally, 96 per cent of employees in the North East and Yorkshire were from a white British background and the average salary was £42,000. Souha Khairallah, groups manager, PRCA, says: "The PR Census has revealed that there are many unique hubs of PR excellence around the UK, with key skills and sectoral expertise. There are also some examples of pay disparity – not surprising but we should continue to monitor to ensure that we do not end up in a situation where we have huge UK-wide inconsistencies." PRCA Census 2016: How do PR professionals spend their time? Women occupy half of senior jobs in UK PR but are they just going it alone?